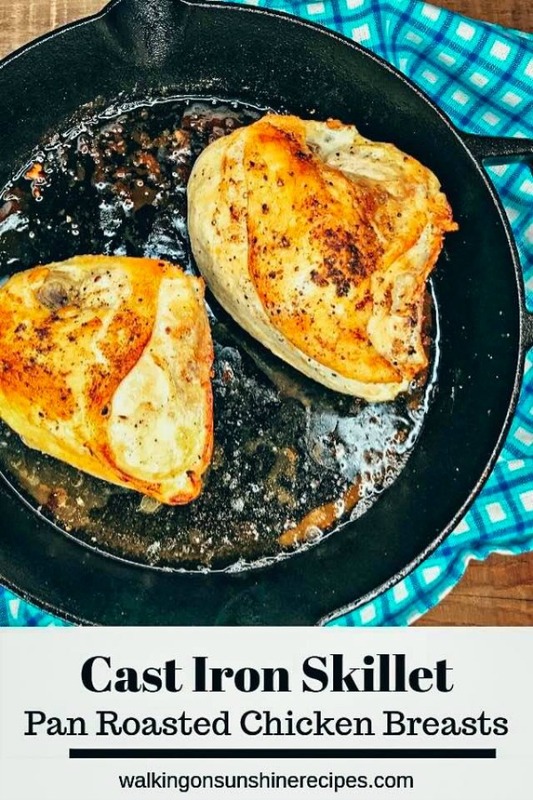 Let me help you turn boring chicken breasts into an amazing dinner option with this easy recipe for Cast Iron Pan-Roasted Chicken Breasts. This a delicious way to get the most tender chicken breasts ever! Ever since we purchased our new induction oven last summer, I have been loving using my cast iron pans for cooking almost everything! The other day I purchased bone-in chicken breasts to make for our dinner but I wasn’t entirely sure how I was going to prepare them. I knew I needed the chicken cooked fast but I also wanted tender, juicy chicken breasts. So I pulled out my cast iron pan. If you don’t cook with cast iron, you are really missing out! The chicken breasts came out incredible and what’s even better, they were ready in under 30 minutes. My husband loved the chicken and used the leftovers the next day to make a few sandwich wraps to take with him to work. Preheat your cast iron pan on top of the stove for just a few minutes. Make sure the chicken is dry. Generously salt and pepper the skin side of the chicken breasts. Add the butter and oil at the same time. Once the butter and oil are melted and heated, add the chicken breasts skin side down. Allow them to sear and cook for a few minutes. Salt and pepper the other side of the chicken breasts. Flip the chicken breasts and allow the other side to sear for another minute or two. Place the cast iron pan in the preheated oven and continue to cook the chicken for about 20 to 30 minutes or until the chicken reaches an internal temperature of 165 degrees. I always use waxed paper or parchment paper when prepping raw poultry. This protects my counter tops and I don’t have to worry about getting bacteria on my cutting boards. I simply throw out the waxed paper when I have the chicken in the cast iron skillet. 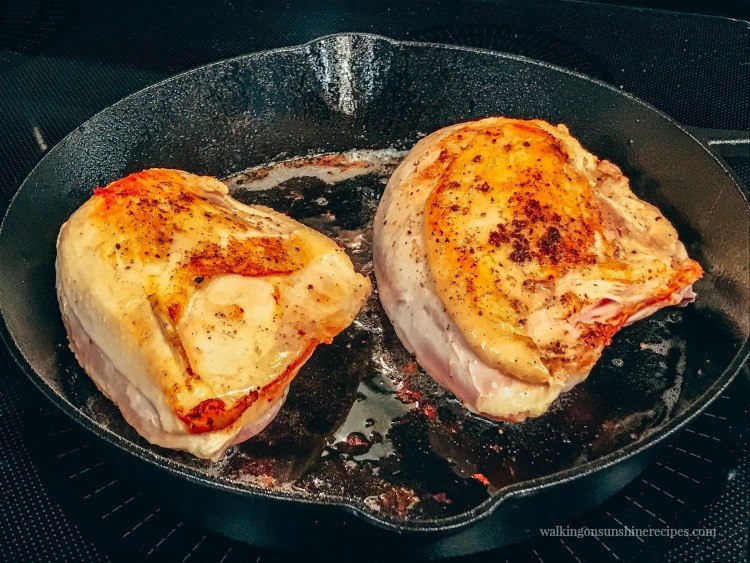 When you sear chicken, you’re not really sealing in the juices, you’re creating an the meat helps you create an intense layer of flavor as the chicken browns or caramelizes. Pat the chicken with a paper towel to make sure it’s dry. Heat the cast iron pan until it is hot and then add the butter and oil. Place the chicken in the pan with the skin side down and then season the other side with the salt and pepper. Allow the chicken to cook for at least 3 minutes. It needs time to develop that crusty brown color. After 20 minutes of cooking, check the internal temperature of the chicken breasts with an instant read thermometer. Chicken breasts are fully cooked when the internal temperature reaches 165 degrees. It’s very important you use an instant read thermometer because the size of chicken breasts all vary. 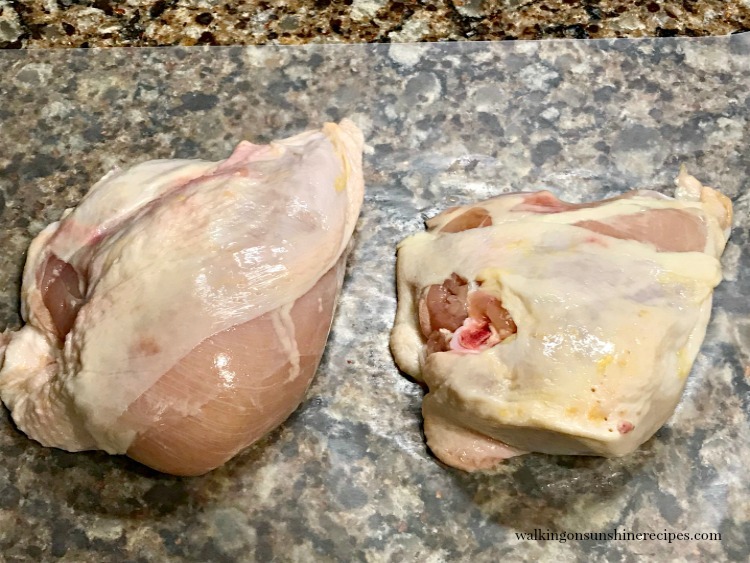 For example, the chicken breast on the left in the photo below was smaller and reached 165 degrees quicker than the other chicken breast. I removed the smaller breast from the pan and allowed the other chicken breast to continue cooking an additional five minutes until it reached the proper internal temperature. 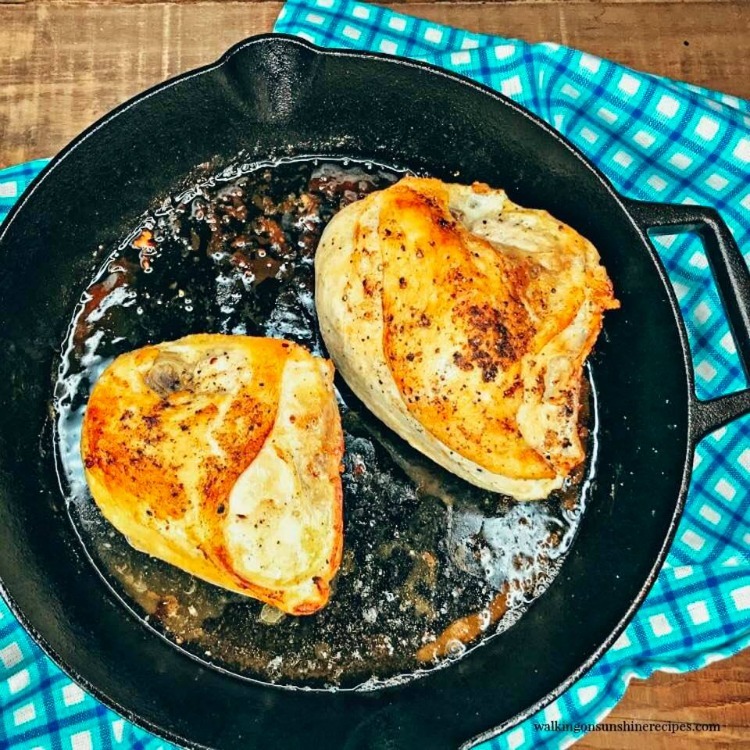 Cast Iron Pan – I love the pans from Lodge because they come pre-seasoned! 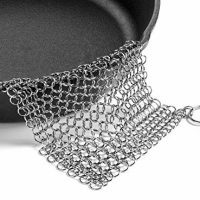 Chain Maille Scrubber – these help tremendously with cleaning bits and pieces stuck to the pan. 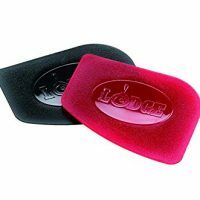 Silicone Hot Handle Cover – this is sitting in my shopping cart on Amazon! 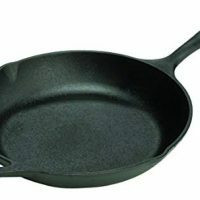 A lot of people are intimidated cooking with cast iron pans because they don’t know how to clean and care for them properly. I wrote a post on caring for cast iron pans last year that you can read HERE—> How to Care and Clean Cast Iron Pans. Allow them to sear for a few minutes. Cooking time will vary depending on how thick your chicken breasts are. I always check the internal temperature with an instant read thermometer. Do not attempt this recipe with frozen chicken breasts. Make sure they are thawed completely before cooking. My cast-iron skillet and I are inseparable. I did NOT know that they work on induction stoves. This recipe is so amazingly simple, and yet it can’t help but be delicious—especially since you have that gorgeous sear that develops with the help of the skillet. Thanks. I was a little surprised when the oven was delivered and they told me I couldn’t use my regular NEW pots on it. But I’m happier now because it forced me to learn to love my cast iron pans. Thanks for visiting! These look so succulent. Normally pan cooked chicken dries out, but it doesn’t look like it here. I’ll be giving this one a go. Yummy!